That is good news that more SLR-104's are in the pipeline! Are mags for these rifles being manufactured as well? Prices and availability being what they are, could be beneficial for all! The M-74N Black Circle Ten 30-round magazines are still being manufactured by Bulgaria to support the SAM5 line. All clear magazines have been discontinued and we are selling out the last of those now. I think that we'll see more of the black magazines pretty soon and on a more consistent basis. Any possibilities of SAM5 imports in the future? Yes, from what I understand that is a possibility but have not heard a peep about them coming in anytime soon. It would be cool if you could offer them in the standard configurations, and also with magwell adapters to take AR-15 mags, kind of like Zastava did with the M85/M90. That would be pretty cool. I think that most would prefer the standard AK magwell but there are people that would appreciate an AR-15 magwell for sure. We've got a pretty sweet promo going on only this weekend. So... are you running short on 106s or got plenty to require the sale? 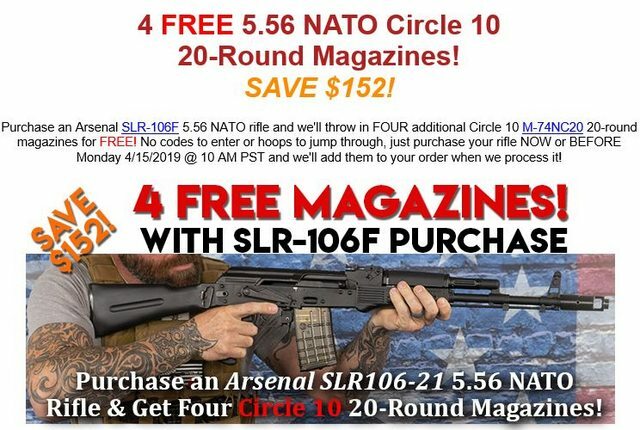 I unfortunately won't be able to offer free M-74N black magazines with a purchase of an SLR106-21. I can however guarantee that if you call us and place a back order for them that you will be called before they go live online. If for some reason we are unable to reach you we will allocate your back order for at least 24 hours prior to releasing them for sale. With quantities being limited we do have to put a cap on the number of available units per purchase in an attempt to give everyone a fair shot at getting them. I will also put something on here first to give everyone a heads up before making them go live. Let me preface this by saying that I am not expert. However I do own a SLR-106CR and have sent it back to Arsenal twice for jamming on 5.56 ammo. From this experiance, I can say personally that my rifle worked just fine with .223 ammo (brass and steel). When I tried 5.56 ammo (from various manufactuers) I experianced the following: trigger slap, pronounced muzzle flash, shift of POI of about 2 inches and at least 2-3 jams (mostly stovepipes) per 30 rd mag. When I switched back to .223 during the same shooting session, everything was fine (POI back to zero, reduced flash, no trigger slap and no jams for mag after mag). What "I" take away from this is this: even though the Arsenal litature says that this rifle is 5.56, "my" rifle is .223. Although I am not 100% happy with with this I am living with it and to me it makes sense. Location: Either the 2nd or 3rd level of hell. It's too hot to tell. this rumormill of 104's coming back makes me feel a level of joy I have not felt in a while. Too easy. I'll work something out in relation to this. Thank you for bringing that up. We can run something for a week long once every three months or so. Is this sale still going on? Looks like I was too late when i went to the website. Unfortunately it is no longer going on. Initially it was good for last weekend and we decided to extend it until Thursday at 10am. Did you happen to pick one up yesterday? Thanks - please let us know. Id like to pick up a couple of things, including that arsenal condor bag. I think I’m just going to wait and see what the Atlantic wbp 5.56 or the PSA 5.56 ends up looking like. If I buy the 106 I will end up sending it off to get a side rail mounted. No doubt voiding my kvar warranty. If breathing on an arsenal gun voids the warranty imagine a side mount! You ever think of the master mount ? I don’t dig the master mount, just not my taste.. If I had a 106 I would end up spending money on a decent side mount and end up paying someone to do it.